As mixed martial arts continues its ascent into the mainstream, the Ultimate Fighting Championship has been the premiere company in promoting this burgeoning style of competition. UFC capitalizes not only on its deep pool of talent, but also on the range of personalities these fighters emanate. But to UFC President Dana White’s chagrin, some of UFC’s greatest fighters have chosen not to fully embrace the spectacle outside of the octagon that sells fights. Brazil’s Anderson “Spider” Silva exemplifies the disregard for the fight business that poses a challenge to the company’s bottom line. But Pablo Croce’s 2011 documentary Like Water puts Silva’s characterization as a business liability into a more human context. The humble family man, whose sole interest is to win fights and return to his family in one piece, takes the stage instead of the aloof and arrogant version of Silva, as perceived in press conferences and other promotional UFC spots. And as the majority of the film centers around Silva’s first fight against Chael Sonnen, the outspoken world-class wrestler from Portland, Oregon, viewers get a completely different sense of reality compared to the way that 2010 fight was promoted. Leading up to Silva-Sonnen I, the UFC promotion team circumvented Silva’s unwillingness to play the fight game by using Silva’s title defense against Damian Maia to demonize him. In that fight, Silva exhibited his superiority not by defeating Maia before time expired, but with a barrage of taunts that Dana White described as an embarrassment to the entire sport. Using this backdrop, Sonnen’s emergence as the next contender in line set the stage for a fan base wondering if Silva’s arrogance could finally be extinguished. However, the point of view in Like Water demonstrates just how subjective the understanding of conflict can be. Immediately juxtaposed against Sonnen’s borderline bigoted approach to verbal antagonism, Silva’s unwavering focus on mastering his craft gives Silva a high ground that forces anti-Silva MMA fans to reevaluate whether they were manipulated into having that stance in the first place. The film exposes the priority of White, Sonnen, and even Silva’s management to sell the fight, thereby revealing the disregard for personal authenticity in a sport powered by controlled brutality. Still considered the greatest mixed martial artist in the world, Silva has defended his Light Heavyweight Championship against an unprecedented 10 times, using a fluid style that appears unstoppable. But his movement in the octagon is where his connection to the documentary’s title ends. The philosophy of adaptability famously described by Bruce Lee does not translate into Silva’s relationship with the company that has made him a household name in MMA. In following Silva and hearing his approach to fighting, viewers see a man using his craft to control his destiny. And since Silva’s talent allows him to play the game on his terms, he demands respect that even the most diehard Sonnen fans cannot deny. 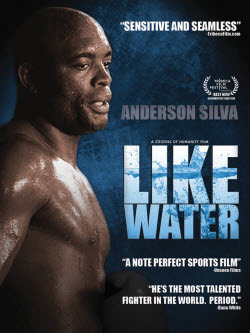 Like Water reminds viewers that underneath the narratives created by UFC are real people who fight to support their families, not simply to please the millions who flock to the modern-day Roman Coliseum every year. And although sensationalism will continue to propel UFC past boxing as the top-tier combat sport, Croce should be commended for keeping that sensationalism honest.